Five Miami Dade College (MDC) students and aspiring artists have been honored with the 2019 Frances Wolfson Art Scholarship to support the costs of tuition, books, fees and art supplies. 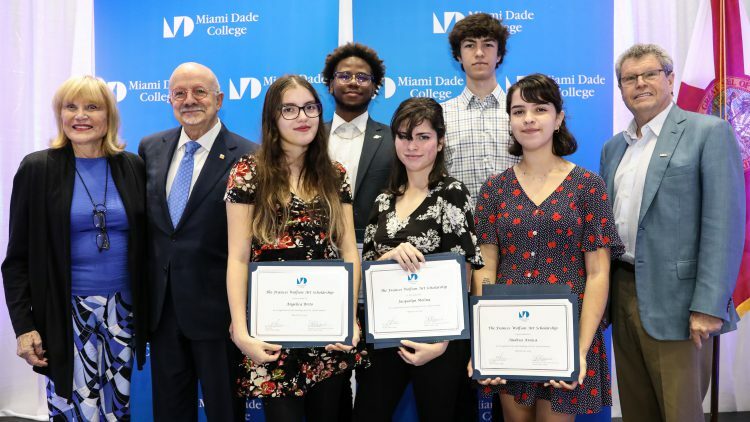 The 2019 scholarship winners are MDC students Andrea Araica, Anthony Campos, Quentin Gibson-Mays and Jacquelyn Molina, and New World School of the Arts student Angelica Brito. They will each receive $1,500 to support their studies next academic year. Their winning art submissions – including original paintings, graphite portraits and mixed media – were on display at a recent luncheon hosted by Miami Dade College Foundation. The late South Florida artist and philanthropist Frances Wolfson established the scholarship in 1964 using proceeds from the sale of six of her paintings to Hallmark. The scholarship helps young artists pursue their dreams, supporting more than 200 students so far. Since 1965, Miami Dade College Foundation has raised essential private funds for MDC to change lives, families, communities and the world through the opportunity of education. Learn more about Miami Dade College Foundation and see how you can make a difference.